My sons love all things water, especially fishing! 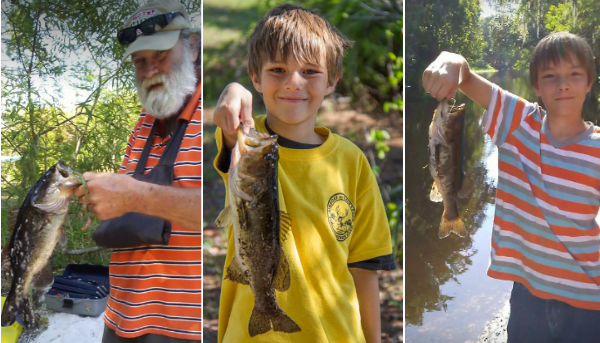 They go every weekend with their Papa out to the local fishing spots here in central FL. Which living in Central FL we have plenty of fishing spots and lots of big bass, bluegills , catfish and more. My boys are already pretty great with a fishing pole but every bit helps, which brings us to getting to try out a new product from King of the Crawls Gooch Juice. Gooch Juice is a juice scent which you spray on your fishing bait that the fish just cannot resist. It comes in both saltwater and freshwater. Gooch Juice™ Natural Freshwater Fishing Scent is your go-to attractant for fishing freshwater. This special blend of Gooch Juice™ is optimized to attract fish like large and smallmouth bass, catfish, crappie, perch, trout, walleye and more. The boys and their Papa were able to try out the Freshwater Gooch Juice, and well I think they made out pretty well.....don't you. We haven't had the chance to try out the Saltwater Gooch Juice but after seeing the results from the Freshwater Gooch Juice, I am sure the results will be great, I know we are excited to try it out. You can purchase Gooch Juice and other great products from King of the Crawl here.